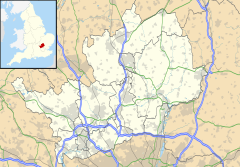 Brookmans Park is a village in Hertfordshire, southeast England, known for its BBC transmitter station. Brookmans Park railway station, on the East Coast Main Line, is operated by Great Northern. It is also a waypoint used in air navigation by Heathrow Airport. The Gaussen family arrived in 1786, when Peter Gaussen bought the estate for his son Samuel. The Gaussens created the estate that led to the development of the village of Brookmans Park. John Somers, The Lord Chancellor, spent the last years of his life in the village. North Mymms commons became enclosed as organised farming developed. Robert Gaussen took over at Brookmans Manor. There was a depression in agriculture after Waterloo. The estate expanded and labouring jobs were created. The expansion of the railways threatened to run through Gaussen's land. Agriculture prices fell as did rents. Scottish farmers came south to take over farms. Brookmans Manor was burned down while the family cruised off the coast of the Netherlands. The Great Northern Railway pushed through the estate. Parts of the estate were sold off to cut costs. The developers moved in. A railway station was built and with it shops and homes. The BBC set up its transmitter station at Bell Bar. The war years resulted in many being evacuated to Brookmans Park from London, but the surrounding area was also hit. Brookmans School was built as the village grew. Local legend has it that Miss Muffet was Patience Moffat, daughter of entomologist Dr. Thomas Moffat (possibly Moffett or Moufet), who lived in the area from 1553 to 1604 on a farm. He had invited a poet over for Christmas. During his stay he overheard Miss Moffat tell her father of how she was eating her curds and whey when a spider came down from the ceiling and frightened her. The poet made an alteration to the name Miss Moffat and wrote a nursery rhyme. However, the traceable origins of the rhyme are murky, as it did not appear in a printed version until 1805. The local connection is celebrated by the inclusion of a spider's web in the badge of Brookmans Park School. A local landmark, visible from much of Brookmans Park, is the Folly Arch which now lies on the road between Brookmans Park and Potters Bar, although originally it marked one of the entrances to the Gobions estate. The remains of a track can still be seen in the fields between Folly Arch and Gobions Wood. The track then passes through the woods, crossing the stream by means of a brick bridge which is now ruined but which was usable as recently at the 1960s. The Folly Arch is said to have been erected by Sir Jeremy Sambrooke, although another story is that it was erected to commemorate a visit of Henry VIII, possibly during the time when Sir Thomas More lived at More Hall. It is a Grade II* listed building. There has also previously been an avenue of lime trees leading from the arch to Gobions wood, but these were destroyed during WWII by the farmer who owned the fields. A local legend maintains that, as a show of extravagance, a farthing was placed under each brick. Generations of local children have tested this legend and found it to be false, but in the process severely damaged the Arch, which was therefore protected by a fence in the 1980s. Brookmans Park railway station serves the village of Brookmans Park in Hertfordshire, England. The station is located 14 miles 37 chains north of London Kings Cross on the East Coast Main Line, on the stretch between Finsbury Park and Hatfield. The station was opened by the London and North Eastern Railway (LNER) on 19 July 1926. The station has four platforms in total, two island platforms on both sides, but only platforms 1 & 4 are used regularly, platforms 2 & 3 are only used during line disruption or engineering work. The west side serves northbound services and another island platform serving southbound services which lies to the east. The station car park parallels the island platforms to the east. This is a typical weekday schedule for trains departing from Brookmans Park station. The village's north east corner is home to the Brookmans Park Transmitting Station. The Brookmans Park Transmitting Station, situated on the A1000 road between Potters Bar and Hatfield in Hertfordshire, played a crucial part in the history of broadcasting in Great Britain, as the first purpose-built twin transmitter station in the world capable of broadcasting two radio programmes simultaneously when it was completed in October 1929. It also played a part in the early development of television broadcasting. On 30 March 1930, experimental television tests were made there using thirty-line pictures. These constituted the first public transmission of simultaneous sound and vision in Great Britain. The station transmitted television broadcasts, during hours when BBC radio was off the air, until 1935. The tower has twice blown down, and according to villagers' reports, it interferes with TV and Radio transmissions, causes automatic garage doors to open of their own accord, and causes radiators, telephones, toasters and waste bins to "play music". It can interfere with DSL broadband modems, and an additional RF (radio-frequency) filter needs to be placed in the incoming line of houses near the transmitter to avoid high error rates. Brookmans Park is also home to a busy VOR transmitter, used by airliners arriving and departing London, and affectionately known by pilots and air traffic controllers as 'The Park'. The Gobions Estate was an ancient private estate which flourished on merchant wealth near the village of Brookmans Park from the 14th to 18th Centuries. The estate's lands now serve the community as a nature reserve and open space. It was owned by the Gobions Woodland Trust, which is now defunct, and the nature reserve is now managed by the Herts and Middlesex Wildlife Trust as Gobions Wood, and another part is Gobions Open Space. It lies close to the Great North Road, adjacent to the village. Its name has varied over the centuries and through many ownerships. Originally it seems to have come from "Sir Richard Gobion who was Lord thereof in the reign of King Stephen" in the twelfth century. By the 16th century, if not earlier, the place was called More Hall after the family of that name which included Sir Thomas More, and also Gybynnes. It had reverted to Gubbens in the 17th century and Gubbins in the 18th. The mansion that had stood on the estate for several hundred years, was of such a fine quality with pleasure grounds designed by Charles Bridgeman, that it was visited by royalty, was eventually demolished by Robert Gaussen (because he owned both houses and was jealous that Gobians was better than his other, Brookmans) about 1840. Now, virtually none of it remains, but a few scattered ruins. In 1956 North Mymms Parish Council acquired the land and the lake now known as Gobions Open Space, rescuing it from potential development. Twenty-nine years later in 1985, householders in the parish subscribed to a fund which helped the Gobions Woodland Trust to buy the large remainder of the estate. Brookmans Park has its own primary school, Brookmans Park School and secondary school, Chancellor's School. Both are popular with parents, both locally and from across the region and are known for consistently high standards of education at all age levels, according to OFSTED reports. Brookmans Park School, opened in 1952, is situated in the village of Brookmans Park, surrounded by green belt countryside. The school itself has a large playing field. Nearly twenty years after the Education Act was passed in 1944 and thirteen years after the site was first designated in 1950 the search and purchase were completed. The sense of the urgent need for the school can be seen from the fact that in less than eighteen months the first pupils would cross the threshold of Chancellor's School and turn the Plan for a secondary school for the children of the villages in the area into reality. The Brookmans Park Hotel was a privately owned hotel situated in the centre of the village, with a pub and restaurant popular with local residents. The hotel was built in the 1930s in a Mason's style with high pitched ceilings, skylights, wood panelling, carved Mason symbols and a large stone fireplace. The hotel was often used for wedding banquets and other local functions. It had six hotel rooms available to guests, making it the only hotel in the area. The Brookmans Park Hotel was taken over by a national brewery chain in July 2006. After extensive refurbishments it reopened in April 2007 as The Brookmans pub and restaurant. The restaurant section was expanded by knocking down the wall between the main bar and old function room; and was noticeably more upmarket than The Brookmans Park Hotel had been. Along with dropping 'Hotel' from its name, the hotel business was closed and a deli business, Oaks Deli, took over what used to be the pool room in the old public house. Prior to having been a pool room, it was a wine bar called "Oaks", perhaps explaining the naming. In summer 2011 The Brookmans was taken over by Peach Pubs and after a refurbishment and menu overhaul reopened in October of the same year. The Brookmans Park Golf Club is located adjacent to Chancellors' School, just off Brookmans Avenue. It is a popular golf club for local players, possessing a full 18-hole course, deemed quite challenging by players locally. The East Coast Main Line runs nearby the course, however the railway does not disrupt the ambience of the course given that the nearest point from the golf course to the railway line is well over 500 yards. The Brookmans Park Lawn Tennis Club, on Golf Club Road, is another popular sporting facility for local players. It possesses four floodlit artificial grass courts, and two macadam courts. It regularly participates in local and regional tournaments. Brookmans Park is in the Church of England Parish of North Mymms, served by St Mary's Church in North Mimms Park. It is served by the Roman Catholic parish of Hatfield which has a Chapel of Ease (St Thomas More) in the neighbouring village of Welham Green. The United Reformed Church has a congregation in the village itself. Wikimedia Commons has media related to Brookmans Park. ^ "Name: THE FOLLY ARCH List entry Number: 1100984". Historic England. Retrieved 27 December 2015. ^ "Brookmans Park – Schedules & Information". www.thetrainline-europe.com. Retrieved 30 November 2015. ^ "293797 – THE GOBIONS WOODLAND TRUST". Charity Commission for England and Wales. Retrieved 27 September 2015. ^ Sarson, Bethany. "Brief history of Brookmans Park primary school". Brookmans Park School. Archived from the original on 23 November 2015. Retrieved 22 November 2015. ^ Sarson, Bethany. "Brief history of Chancellor's School". Chancellor's School. Retrieved 22 November 2015. This page was last edited on 18 November 2018, at 11:27 (UTC).